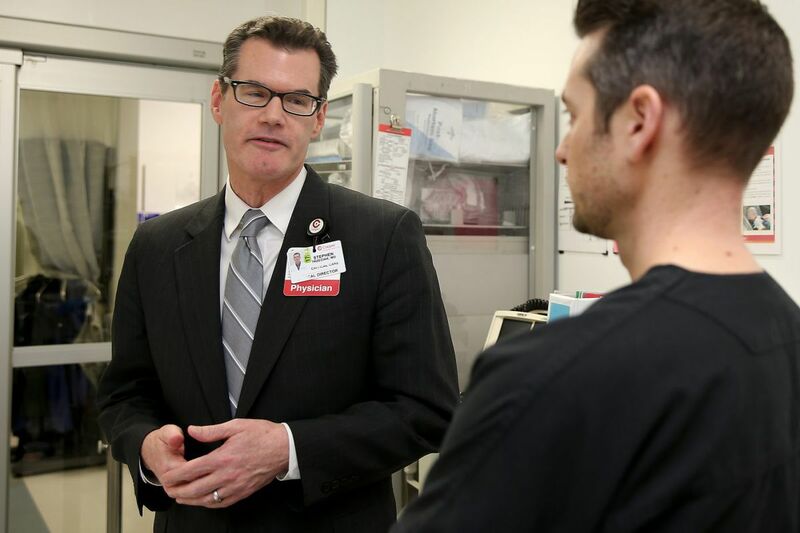 Stephen Trzeciak (left), a critical care doctor, and Brian Roberts, an emergency physician, talk at Cooper University Hospital, where both work. Both were involved in a study of how compassionate care affects the likelihood of developing PTSD. A study done at Cooper University Hospital in Camden has found a link between compassionate care in the emergency department and a reduction in post-traumatic stress disorder in patients treated there. The study, which will be published in the journal Intensive Care Medicine, asked 99 people who came to Cooper’s emergency department with life-threatening lung and heart problems to rate their primary nurses and doctors on a 40-point compassion scale. For every one-point increase in the scale, the odds a patients would have PTSD symptoms one month after discharge fell by 7 percent. The new research is part of a growing body of scientific work at Cooper exploring the impact of compassion on patient outcomes and staff burnout. “We’re testing the hypothesis that compassion matters,” said Stephen Trzeciak, a critical care physician who is a coauthor of the study. Trzeciak, chief of medicine at Cooper University Health Care and professor and chair of medicine at Cooper Medical School of Rowan University, is also coauthor of a book slated for publication this month, Compassionomics: The Revolutionary Scientific Evidence That Caring Makes a Difference. He has made studying the “compassion crisis” a priority because he thinks it’s the most pressing problem in modern medicine. Trzeciak thought the emergency department was a good place to study psychological trauma. He was especially interested in medical emergencies rather than physical injuries, because they are under-recognized as a source of long-term distress. “Patients go through this experience of feeling like they’re going to die, and feeling very helpless,” he said. Fear and perceived threat seem to be crucial to the development of PTSD. While he considers the new study preliminary, it strengthens his hypothesis that some medically related PTSD could be preventable, Trzeciak said. That would likely be more effective than the current approach of trying to treat PTSD after it’s established. PTSD is important not only because it is emotionally painful, but because it is associated with poorer quality of life, higher costs, and more health problems. Overall, a quarter of patients in the study developed PTSD. Forty-one percent of those who rated their care team in the bottom quarter for compassion had PTSD. Only 16 percent of patients who rated their doctors and nurses in the top quarter got PTSD. Cooper is seeking a grant for a larger study of multiple emergency departments. Trzeciak said young doctors are taught about the importance of their relationships with patients, but offering kindness and connection has been seen more as the moral thing to do rather than as a key component of healing. “Historically, we believe that people have underestimated the importance of compassion,” he said. There’s evidence it can be taught, and that is another thread of Cooper’s research. Trzeciak’s group is reviewing previous studies to determine how to teach it most effectively. The hospital’s emergency department staff has not received compassion training.